If all goes according to plan, this will be the only place I talk extensively about craft in this blog. By craft I mean “the process of writing” — my goal with Magpie & Whale is to write, not write about writing. 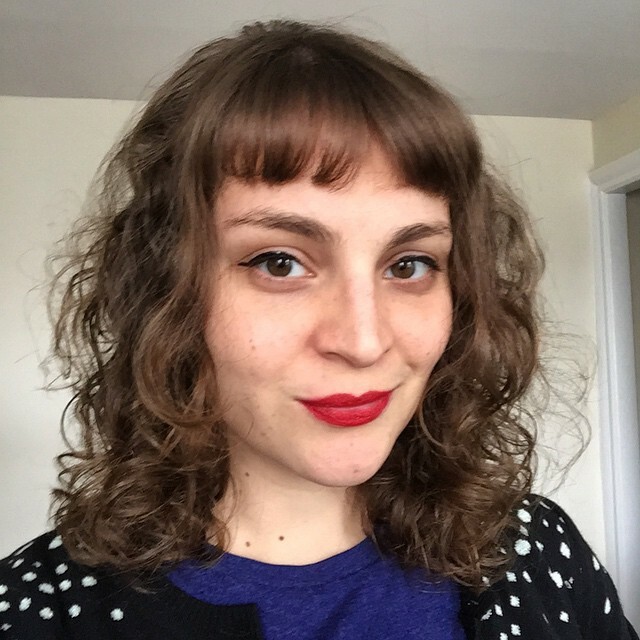 There are many excellent blogs and resources out there on that front (check my sidebar for a few); all I want to address here is how I do it, and what experiences have been most helpful for my development as a storyteller. Every writer or artist or creator of any sort should be lucky enough to find a community, whether in person, online or otherwise, that supports, encourages and critiques their work with their best interests at heart. Opportunities for this are everywhere, and if you can’t find the right one for you, you can make it. I’ve joined clubs, taken classes, founded magazines, started conversations and, most importantly, I’ve done a lot of writing on my own. Loving to write and tell stories is, in the end, what’s going to help you the most. But you can also learn a great deal from unexpected sources. Two of the most valuable experiences I’ve had as a writer have involved mentors and classes, though neither of them was about creative writing, per se. This essay is not me advocating that you go out and replicate them, but I hope the lessons I’ve learned are of use and can help you figure out what’s right for you. My first exposure to marketing came after college, from a temp job as a copy editor at a large nonprofit. I had a hand in too many brochures, ads, postcards, signs and packets to count, which gave me a lot of exposure to other people’s writing. Marketing materials aim to get to the point quickly and efficiently. You want to get your reader’s interest, tell them why your service or product will benefit them, and let them know how to get it, in as little time and/or space as possible. Most of our in-house clients knew in general what they wanted to convey, but overwhelmingly, their jobs had one thing in common: they used too many words. Everyone does this, particularly the first time around. We take too long to say what we mean. We hesitate, we pad our sentences, we repeat ourselves, and we talk around our arguments. We also tend, in first drafts especially, to mash out whatever best approximates what we hope to say and cross our fingers for whatever comes next. This is fine. This is what first drafts are for. They’re ungainly, complicated and full of discoveries. They’re what you mine for further drafts. But all too often, we stop early. I turned in way too many first drafts in high school and college, because I’m a perfectionist and resist working unless I have an absurdly close deadline. This fooled a lot of teachers, but not all of them, and they were the ones I always vowed to do better for next time. Because we were working with other people’s words, it was much easier to be ruthless about whittling down copy to its most essential parts. The more I learned to recognize unnecessary text, the less I was satisfied to see it in my own work. I tried to use single adjectives where before I’d used a prepositional phrase. I tried to make my verbs more descriptive, rather than relying on be forms and adverbs. I looked for ways to condense wherever possible, whether within sentences, paragraphs or the whole work. 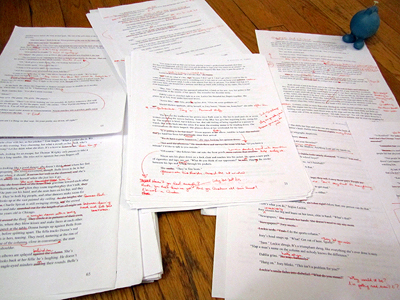 I go through a lot of red ink in edits. Also, sadly, trees. In a way, this has become my favorite part of editing. Part of that is because it’s a signal that I’m in the home stretch: line edits should always come after structural edits are done. It’s become a game, to see where I can weed out the words I don’t need. There’s something almost Tetris-y about it. Becoming proficient took a lot of practice, though, and a lot of guidance from my boss and the other editors. This is a skill gained through a freakish amount of close reading and repetition: I always try to remind people of that, and reassure them, when I hand in edits at work, full of tracked changes or red pen. There’s a reason I find this important. In marketing, inefficient copy obscures the sell. In fiction, it obscures emotion. May We Have a Suggestion of Anything at All? Chicago is the best city in the world to learn about improvisational theater. Most of the comedians and writers you think are funny probably have a Chicago connection. I signed up for classes because I thought it would be fun, and because I wanted to meet people. Both happened, to my great delight, but I was totally unprepared for how psychologically intense it would be. The real risk, however, is letting go of control. The goal is not to create a plot within a scene (Action A leads to Action B leads to Action C, and if I can manipulate the action, it ends up at a punch line I like). The goal is to choose a point of view, an emotional center, and see where it takes you when you play off another. Many students, including myself, will do everything they can to protect themselves from having to feel or portray an emotion honestly in front of people, even if it’s just their classmates. We talk too much, we pull back from intense moments, we self-deprecate, we stay reserved, we tell jokes. Emotion, however, is where the show is. It’s what people come to see. Early on, I recognized that my Writer Brain was in conflict with my Improviser Brain. Not planning or plotting runs counter to years of writing experience, but improv is not kind to control freaks, and I had to adapt. At best, players have a few minutes in which to move their audiences. They have no time to mess around, and so there’s no teasing or delay: they drop bombs and gleefully see what happens next, over and over again. For example, rather than spending an entire show keeping the secret of a cheating spouse, the spouse confesses at the top of the scene. There’s almost no such thing as too much escalation. The truth is it’s much easier (and more fun) to find a point of view and explore it than to dictate how your character is going to react. This is as true in writing as it is onstage. When you push yourself and your work, and when you hook your audience with honesty and emotion, something amazing can happen that not even you could have planned. The biggest step is not to be scared of it. Love telling stories. Do it all the time. Do it when you could be doing something else. Do it unprompted. Do it for fun. Entertain yourself. Surprise yourself. Delight yourself. Be undaunted. Tell stories. That’s still the best thing out there for improving and finding out what you can do. Write or take pictures or make movies or build sculpture or make music or draw constantly. Just love it. Cliches happen because they’re true. Don’t take my word for it. Give it a try. Even if your audience is simply you, your audience will thank you for it.